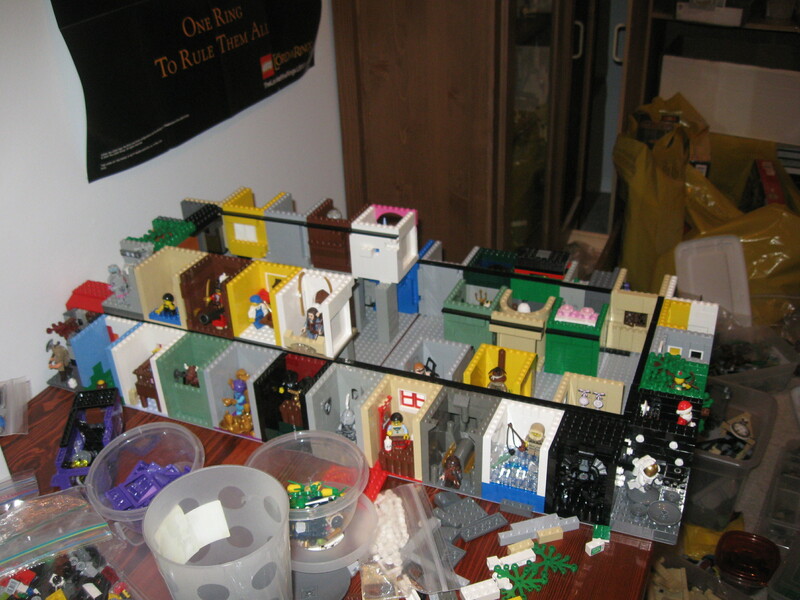 I started work on a MOC this month where I made small 8×8 stud vignettes for various minifigs. I am making a minimum of 56 of them and I’ve finished 50 so far. I’m running short on certain colors, which means having to be choosy about the way to depict certain scenes or getting creative with bricks. But I’m happy about how it’s turned out so far. So today I thought up two other MOCs I want to build for BrickFair. Am I going to have enough time? Meep! I sure hope so! Now I’m up to 4 things I’m building. However, the good news is, I totally finished one of the them today! That’s right! I’m a little… terrified to conquer the Gryffindor Common Room ceiling… so instead I worked on one of the new MOCs today. With any luck, I should have that one done tomorrow. It’s a throwback to the sort of buildings I once made when I was 7 or 8. So I’m hoping it’ll be like riding a bike and I’ll have it done in no time. And the other one I came up with today should be relatively quick as well. I need to order some new heads, i think. But otherwise I think I’ve got everything I need for it brick-wise. Thank goodness. This is an EXPENSIVE hobby! Progress as of 07/25/09: Photos under here- SPOILERS! For my 101 Goals in 1001 days I decided I wanted to come up with something big to make out of LEGO bricks to possibly display at a con. (My goals can all be found on this LJ: just-the-things) And one of my new year’s resolutions for 2009 was to display something at a con. The top design is supposed to be Gryffindor Tower. I jokingly call this design “the Gryffindor Wedding Cake”. The bottom one is the Slytherin Common Room with the lake on top of it. As you can see, I’m not much of an artist.